Training to HMs on School Academic Matters and School Leadership: SCERT Telangan has Prepared 5-day Orientation Programme for Headmasters and SCERT is planned planned to conduct in all the Districts at Divisional Level in two spells on academic aspects and school leadership. Proceedings Of The Director Of School Education, Telangana, Hyderabad, Rc. No. 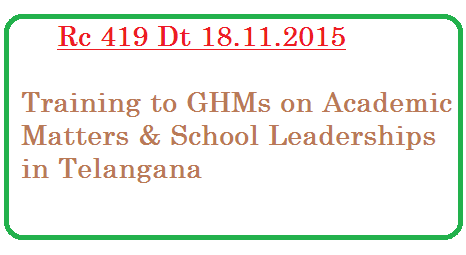 419/D/C&T/TSCERT/2015, Dated: 18.11.2015, Subject: SCERT, Telangana, Hyderabad - Orientation to the Headmasters on school academic matters and school leadership in two spells i.e. Spell-I from 20-11-2015 to 24-11-2015, Spell-II from 26-11-2015 to 30-11-2015- Drafting the State Level Observers to the Districts - Orders issued - Reg. The orientation is to all the Headmasters working in High Schools i.e. Government, Zilla Parishad, Aided Management, Model Schools, KGBVs, all types of Residential Schools under the management of School Education, Social Welfare, Tribal Welfare, BC Welfare, Minority Welfare etc. In this connection, State Level Observers are drafted to the Districts to observer the training programmes. The observers attend the planning meeting also on 19th November, 2015 followed by trainings. Following are the Observers drafted to the Districts.